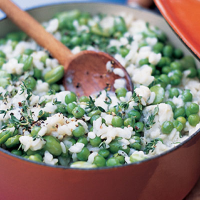 A simple but delicious, fresh-flavoured risotto. Heat the oil in a large pan and cook the onion, garlic and thyme for 5 minutes until softened. Stir in the rice, cook for a minute, then add the wine and boil vigorously for 2-3 minutes until the liquid has been absorbed. Pour in half the stock and simmer for 10 minutes or until the liquid has been absorbed, stirring from time to time. Add the remaining stock, simmer for 5 minutes, add the peas and beans, and cook, uncovered, for 5 minutes, stirring, until all the liquid has been absorbed and the rice is tender. Divide between bowls and top with the dolcelatte and black pepper.